1. PREVENT PIPES FROM BURSTING: It is crucial to address any vulnerable pipes and wrap them in insulation. Also, make sure that your pipes are not exposed to cold outdoor air from cracks or holes in your home. Some faucets may need to be kept on a slow drip during extreme cold snaps. If your pipes do freeze and/or burst, call for emergency plumbing assistance right away. 2. 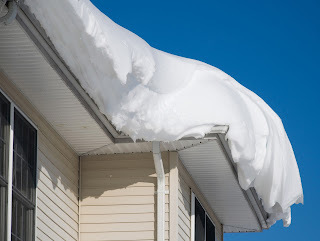 INSPECT & REPAIR YOUR ROOF: In the event of snow or heavy precipitation, you need a strong roof that is leak free. The weight of snow or constant heavy rain can end in severe damage to your roof and the interior of your home if your roof is not well maintained. You should also invest in a roof rake to remove snow that builds up on your roof. 3. CLEAR YOUR GUTTERS: Clearing your gutters will allow water to drain away from your residence which is very important to the integrity of your home. Congested gutters can even freeze over during winter months. If your gutters aren't flowing, it can cause extensive damage to the interior and exterior of your home.